Upcoming road closures will add a certain frisson of adventure to life at Bates. On Friday, July 20, College Street will be closed at Mountain Avenue for the construction of a raised pedestrian crossing, or traffic table, to link Alumni Walk with the new student housing. Signage will help direct motorists to alternate routes. That closure will last only a day, although the street will be restricted to a single traffic lane during the three days prior. But a project starting 10 days later will be more inconvenient for motorists in the vicinity of Bates. In order to run utilities between the eastern and central portions of campus, Central Avenue will be closed for an entire week starting July 30, said Paul Farnsworth, project manager for the new dining Commons and Alumni Walk construction. 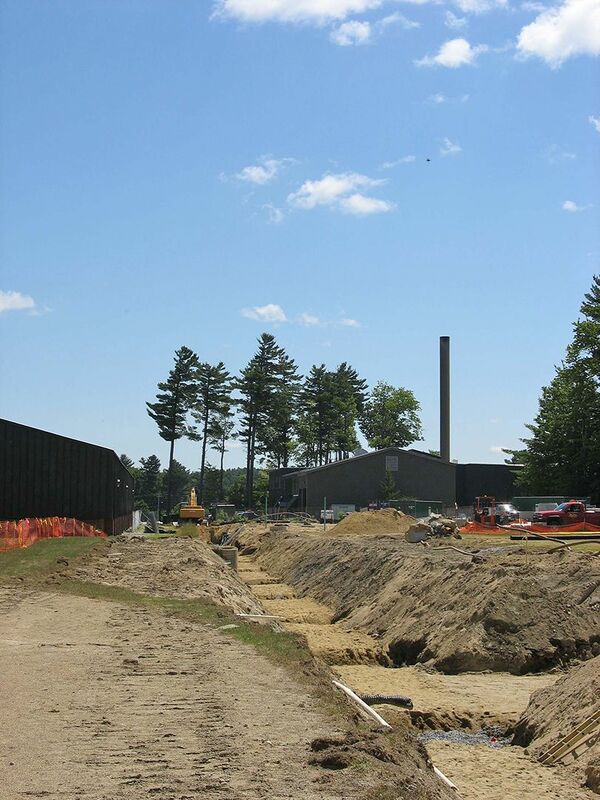 The Central Avenue dig will accommodate a number of utilities, Farnsworth explained — steam, water, gas, electricity and telecommunications, all aligned with a trench already open across Leahy Field to the Cutten Maintenance Center and the campus steam plant. Elsewhere on campus, or under it, the laying of steam lines is progressing steadily. 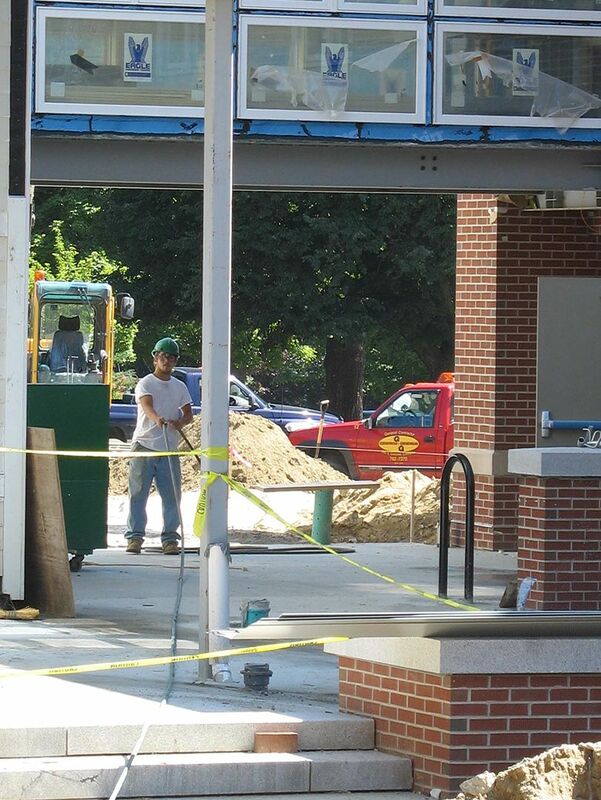 A new connection to Alumni Gym that had been delayed by a bad part is finished, and hookups to Dana Chemistry and Hedge Hall are proceeding on schedule. New dining Commons: Granite, brick and slate are now present on all four sides of Commons. Masons sheathing the exterior with brick and dark gray granite are nearly done with the east and south walls, and moving fast along the west and north. “There’s not a whole lot more exterior stone to do,” Farnsworth said. Especially attractive will be a curved granite wall at the east entrance, which masons began in early July. The granite, to be complemented by large windows and zinc trim, “is going to look pretty slick,” said Farnsworth. Workers laying the slate roof cleared an obstacle on July 11 when a representative from project architect Sasaki Associates dealt with a few lingering issues involving the ventilation monitor, the big box at the peak of the roof. Once that structure is done, the roofers can finish the slate. Meanwhile, most window openings have been covered with the kind of polyethylene sheeting familiar from the student housing project. 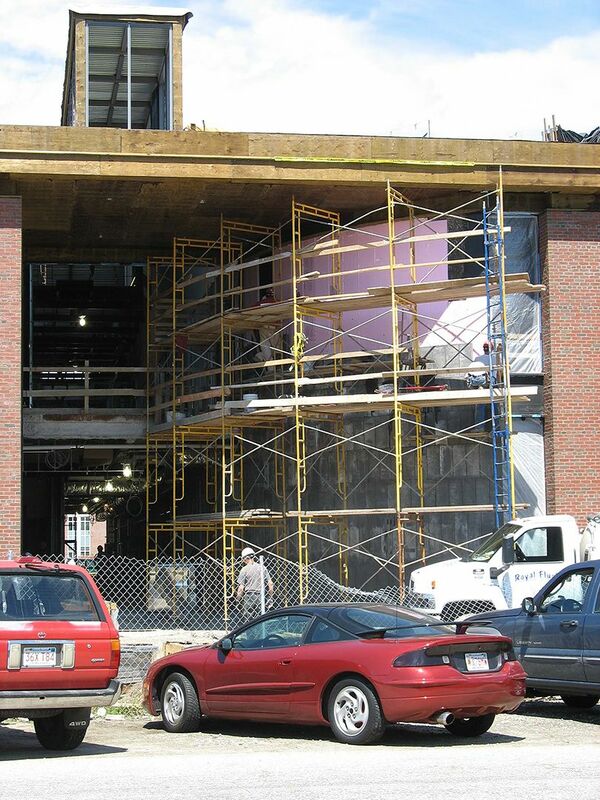 An exception is a large window at the east entrance, which remains open because general contractor Consigli Construction hoists materials and equipment through it into the second story. The windows themselves need to be custom-fitted to each opening and won’t be appearing until September, said Farnsworth. Alumni Walk: Somehow or other, things tend to balance out. While July 30 is the day Central Avenue is being closed for a week, around that same time the west end of Alumni Walk should be opened up for campus use. That will be especially welcome considering the way the access routes across the 2.5-acre work site have been shifting around in recent weeks, like the staircases at Harry Potter’s Hogwarts. 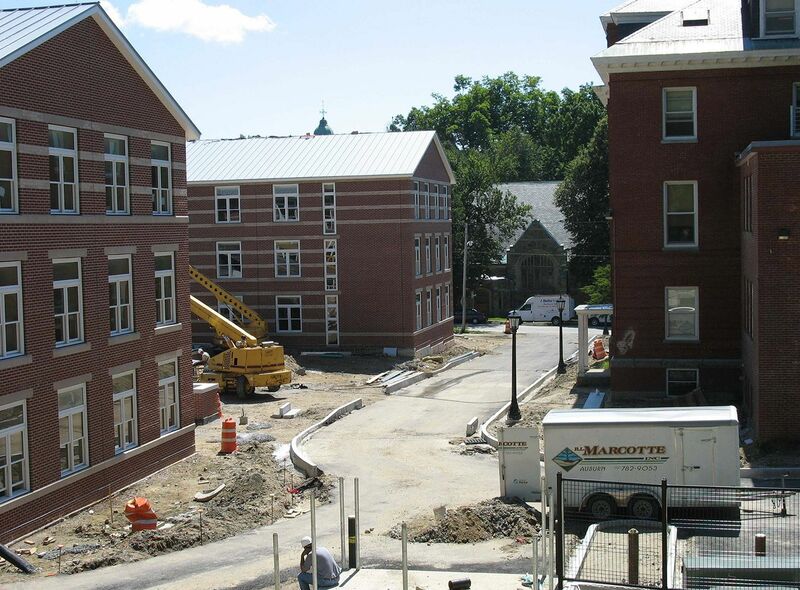 Work soon to be done includes the swapping-out of an old telephone pole where Alumni Walk meets College Street. Also at this entrance, granite pavers will create two smooth, and therefore handicapped-accessible, paths through the apron of rough cobblestones already in place. The bulk of Alumni Walk paving, though, takes the form of cut and polished asphalt-and-aggregate blocks that will run east, in parallel paths, to the new Commons. 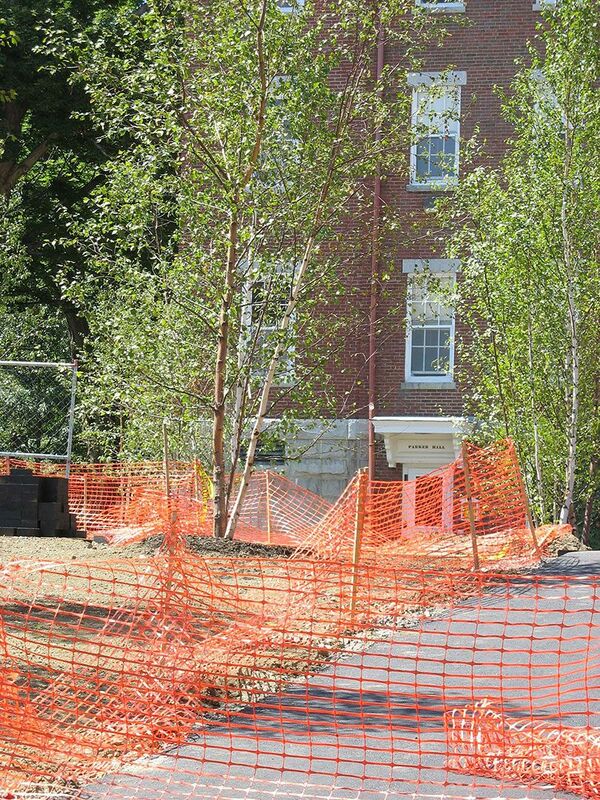 As of July 12, masons had laid 380 feet of pavers on the 20-foot-wide path, and it was hoped that the 10-foot path would extend that far by the week of the 16th. Conspicuous on the walk in recent weeks are concrete rectangles at the building entrances as far east as Dana and Lane halls. Those rectangles will be bordered with granite and filled in with the asphalt pavers to embellish each entrance. New student housing: With occupancy set to start next month, general contractor H.E. Callahan of Auburn and its “subs,” or subcontractors, are concentrating on making the new residence inhabitable. In other words, said project manager Pam Wichroski, taking a back seat are tasks like landscaping and even some jobs in sections of the building that don’t affect livability. In fact, as Wichroski explained, completing a project like this is not like throwing a switch. Instead, it’s incremental. “It’s kind of a gray area, a transitional period. We call it ‘substantial completion,’ ” Wichroski said. Though Bates will receive the keys to the building and students will move in around the middle of August, work will continue thereafter. And the repair of minor problems covered by warranty could go on for months. Likewise, the formal commissioning process that ensures the proper functioning of technical systems won’t end with occupancy. Hot water for washing, for instance, comes from a “dual fuel” system that can’t be tested all at once. In warm weather, the boilers are gas-fired and that can be checked when all the parts are in place. But in the cold months, steam from the campuswide system will heat the boilers, so that can’t be tested until sometime this fall. As for recent progress, there’s been plenty. Inside the three-section building, Wichroski reported, the College and the contractor made their “punch list” — that is, “items they need to complete before we take it over,” she explained — for the interior of the eastern wing. There’s still work left to do inside that wing, also known as a “flanker,” but the punch-list phase signifies that the end is in sight. The west flanker’s punch list will be done around the end of the month, Wichroski added. Meanwhile, site work continues. The barbecue, composed of a brick counter with an opening for a gas grill, is in place in the courtyard outside the fireplace lounge. Paving continues in the courtyard and under the breezeways, aka “bridges,” that connect the building’s center section with its wings. On that center section, semi-circular metal louvers to cover air intakes finally arrived and were installed the weekend of July 14. That clears the way for siding to be completed. The lengthy roofing process is also near the end, as the east dormers are finally receiving their gray copper topping and the last few bare patches on the flat expanses are being covered. Otherwise on the exterior, it’s mostly a matter of detail work, Wichroski said — caulking, flashing and installing trim around windows and other features. 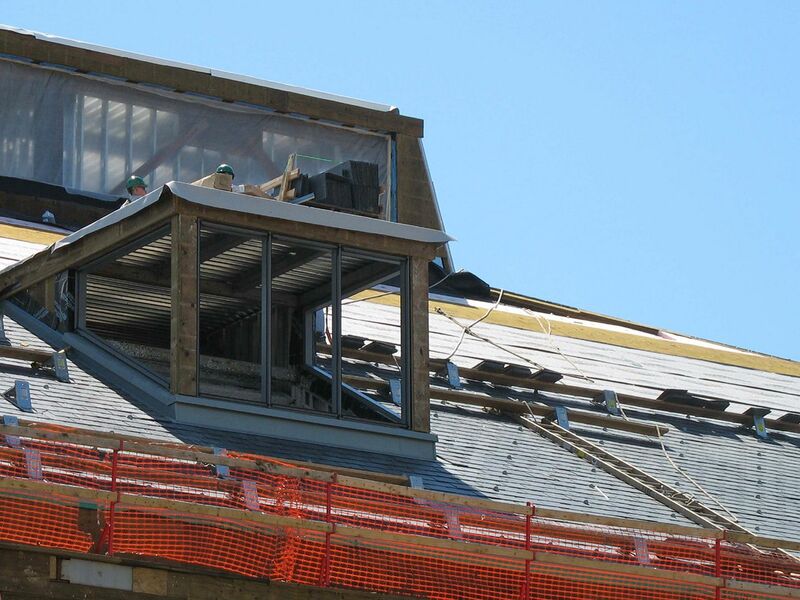 On July 16, Campus Construction Update watched as workers started fitting a bit of gingerbread onto the porch roof at the residence director’s quarters, in the center section. Facing north, across Mountain Avenue toward Libbey Forum, the porch will express a vague traditional New England style. 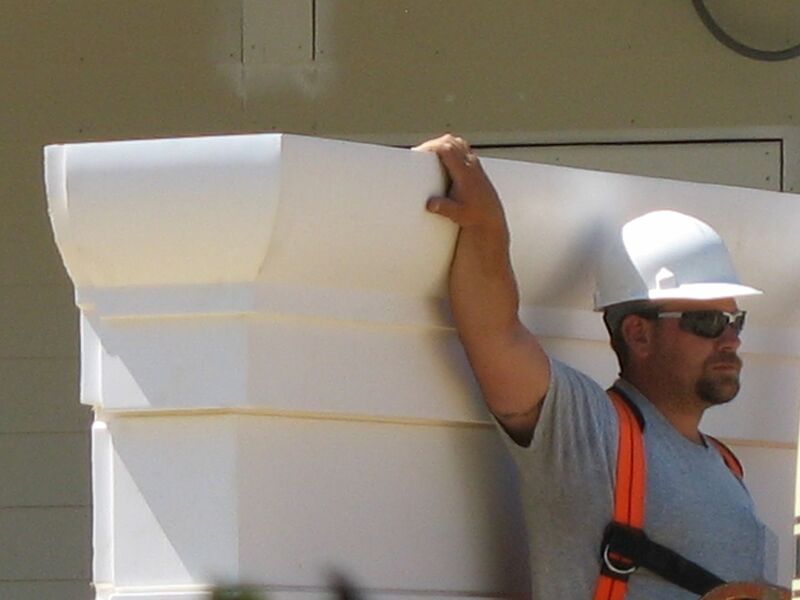 Decidedly not traditional, though, is the substance of the columns, end caps and other ornaments: Fiberglas-reinforced polyester. Set up a couple of carbon-fiber rocking chairs, pour some Red Bull and plug in the iPod, and it’ll be like a cover from Yankee magazine. 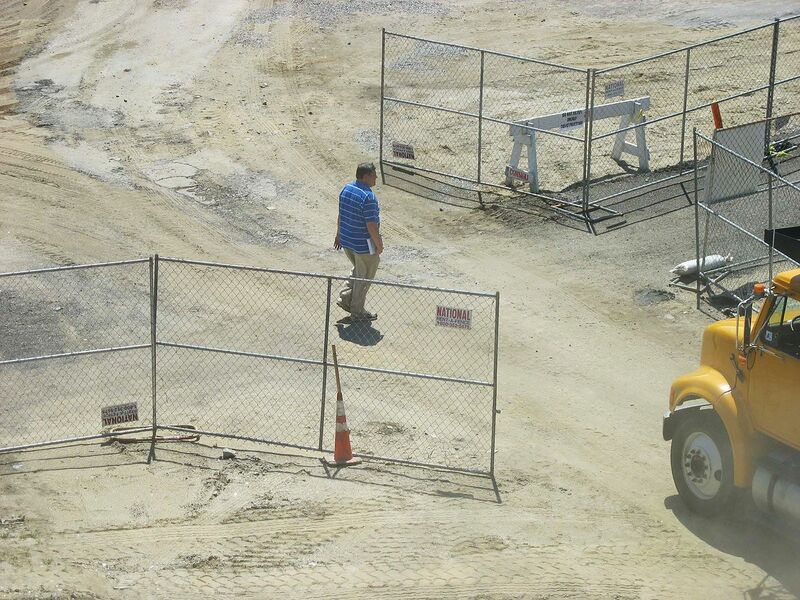 Our back pages: Campus Construction Update appears every other week. See an index of earlier updates here.